Installation Examples : BLOXsport Wheel Spacers, Aluminun 7075-T6 Forged! 1. BLOXsport Forged Aluminum Alloy 7075-T6 Wheel Spacers (2"/50.8mm) for Mercedes-Benz G Class. 2. BLOXsport Forged Aluminum Alloy 7075-T6 Wheel Spacers (30mm) for BMW X5 E70. 3. BLOXsport Forged Aluminum Alloy 7075-T6 Wheel Spacers (8mm) for Mercedes-Benz C63 W204. 4. BLOXsport Forged Aluminum Alloy 7075-T6 Wheel Spacers (30mm) for BMW 5 Series F10. 5. BLOXsport Forged Aluminum Alloy 7075-T6 Wheel Spacers (30mm and 35mm) for BMW M6 F06. 6. BLOXsport Forged Aluminum Alloy 7075-T6 Wheel Spacers (30mm and 35mm) for Range Rover Sport. 7. BLOXsport Forged Aluminum Alloy 6061-T6 Wheel Spacers (30mm ) for Land Rover Denfender. 8. BLOXsport Forged Aluminum Alloy 6061-T6 Wheel Spacers (30mm ) for TOYOTA Prado LC150. 9. BLOXsport Forged Aluminum Alloy 6061-T6 Wheel Spacers (25mm ) for FORD Mustang 2015. 10. BLOXsport Forged Aluminum Alloy 7075-T6 Wheel Spacers (30mm ) for JEEP Wrangler 2014. 11. BLOXsport Forged Aluminum Alloy 7075-T6 Wheel Spacers (30mm ) for BMW M6 F06 (Example 2). 12. BLOXsport Forged Aluminum Alloy 7075-T6 Wheel Spacers (8mm ) for Mercedes Benz A45 AMG. 13. BLOXsport Forged Aluminum Alloy 6061-T6 Wheel Spacers (10mm ) for Mercedes Benz CLS W218. 14. BLOXsport Forged Aluminum Alloy 7075-T6 Wheel Spacers (8mm ) for Mercedes Benz C Class Wagon W204. 15. BLOXsport Forged Aluminum Alloy 7075-T6 Wheel Spacers (35mm ) for Porsche Cayenne 958. 16. BLOXsport Forged Aluminum Alloy 7075-T6 Wheel Spacers (35mm and 60mm ) for TOYOTA GT86. 17. BLOXsport Forged Aluminum Alloy 7075-T6 Wheel Spacers (2") for Mercedes Benz G Class. 18. BLOXsport Forged Aluminum Alloy 6061-T6 Wheel Spacers (15mm) for Honda Civic FD. 19. BLOXsport Forged Aluminum Alloy 6061-T6 Wheel Spacers (20mm) for MITSUBISHI Lancer EX. 20. BLOXsport Forged Aluminum Alloy 7075-T6 Wheel Spacers (28mm) for Ferrari California. 21. BLOXsport Forged Aluminum Alloy 7075-T6 Wheel Spacers (35mm) for BMW X3 E83. 22. BLOXsport Forged Aluminum Alloy 6061-T6 Wheel Spacers (30mm ) for Land Rover Denfender (Example 2). 22. BLOXsport Forged Aluminum Alloy 7075-T6 Wheel Spacers (35mm) for Mercedes Benz G Class. 23. BLOXsport Forged Aluminum Alloy 7075-T6 Wheel Spacers (30mm) for Mercedes Benz G Class. 24. BLOXsport Forged Aluminum Alloy 7075-T6 Wheel Spacers (30mm) for Ranger Rover Sport 2011. 25. BLOXsport Forged Aluminum Alloy 7075-T6 Wheel Spacers (10mm and 15mm) for Mercedes Benz A Class. 26. BLOXsport Forged Aluminum Alloy 6061-T6 Wheel Spacers (35mm) for Ford Ranger. 27. BLOXsport Forged Aluminum Alloy 6061-T6 Wheel Spacers (20mm) for Buick LaCrosse 2012. 28. BLOXsport Forged Aluminum Alloy 6061-T6 Wheel Spacers (35mm) for MITSUBISHI Lancer EX. 29. BLOXsport Forged Aluminum Alloy 6061-T6 Wheel Spacers (25mm) for Subaru Forester. 30. BLOXsport Forged Aluminum Alloy 6061-T6 Wheel Spacers (40mm and 60mm) for TOYOTA GT86 wide-body kit. 31. BLOXsport Forged Aluminum Alloy 7075-T6 Wheel Spacers (30mm ) for Porsche Cayenne 958 (Example 2). 32. BLOXsport Forged Aluminum Alloy 7075-T6 Wheel Spacers (25mm) for BMW 6 Series 630 E63. 33. BLOXsport Forged Aluminum Alloy 6061-T6 Wheel Spacers (35mm) for TOYOTA Hilux. 34. BLOXsport Forged Aluminum Alloy 6061-T6 Wheel Spacers (65mm and 85mm) for Hyundai Rohens Genesis. 35. BLOXsport Forged Aluminum Alloy 7075-T6 Wheel Spacers (25mm) for Range Rover Sport (Example 2). 36. BLOXsport Forged Aluminum Alloy 7075-T6 Wheel Spacers (35mm) for Range Rover Sport (Example 3). 37. BLOXsport Forged Aluminum Alloy 6061-T6 Wheel Spacers (15mm and 20mm) for TOYOTA REIZ or Mark X. 38. BLOXsport Forged Aluminum Alloy 7075-T6 Wheel Spacers (35mm) for Mitsubishi Pajero V93. 39. BLOXsport Forged Aluminum Alloy 7075-T6 Wheel Adapters (30mm) for Volvo XC90 install BMW Wheels. 40. BLOXsport Forged Aluminum Alloy 6061-T6 Wheel Spacers (20mm) for Mazda CX5. 41. BLOXsport Forged Aluminum Alloy 6061-T6 Wheel Spacers (25mm) for Nissan A31. 42. BLOXsport Forged Aluminum Alloy 6061-T6 Wheel Spacers (20mm) for TOYOTA Alphard. 43. BLOXsport Forged Aluminum Alloy 6061-T6 Wheel Spacers (35mm) for BMW 5 Series F10. 44. BLOXsport Forged Aluminum Alloy 6061-T6 Wheel Adapters (18mm) for BMW 3 Series E30 4x100 to 5x120. 45. BLOXsport Forged Aluminum Alloy 6061-T6 Wheel Spacers (15mm and 25mm) for BMW 3 Series E90. 46. BLOXsport Forged Aluminum Alloy 6061-T6 Wheel Spacers (15mm) for BMW i3. 47. BLOXsport Forged Aluminum Alloy 6061-T6 Wheel Spacers (25mm) for Ford EDGE. 48. BLOXsport Forged Aluminum Alloy 6061-T6 Wheel Spacers (25mm) for Ford Explorer. 49. BLOXsport Forged Aluminum Alloy 6061-T6 Wheel Spacers (15mm and 20mm) for Jaguar XF. 50. BLOXsport Forged Aluminum Alloy 6061-T6 Wheel Spacers (20mm) for Honda Jazz Fit. 51. BLOXsport Forged Aluminum Alloy 6061-T6 Wheel Spacers (25mm) for Honda Jazz Fit (Example 2). 52. BLOXsport Forged Aluminum Alloy 6061-T6 Wheel Spacers (35mm) for TOYOTA Land Cruiser Prado LC120. 53. BLOXsport Forged Aluminum Alloy 6061-T6 Wheel Spacers (25mm) for NISSAN TIIDA. 54. BLOXsport Forged Aluminum Alloy 6061-T6 Wheel Spacers (15mm and 25mm) for Porsche Macan . 55. BLOXsport Forged Aluminum Alloy 6061-T6 Wheel Spacers (20mm) for TOYOTA REIZ or Mark X (Example 2). 56. 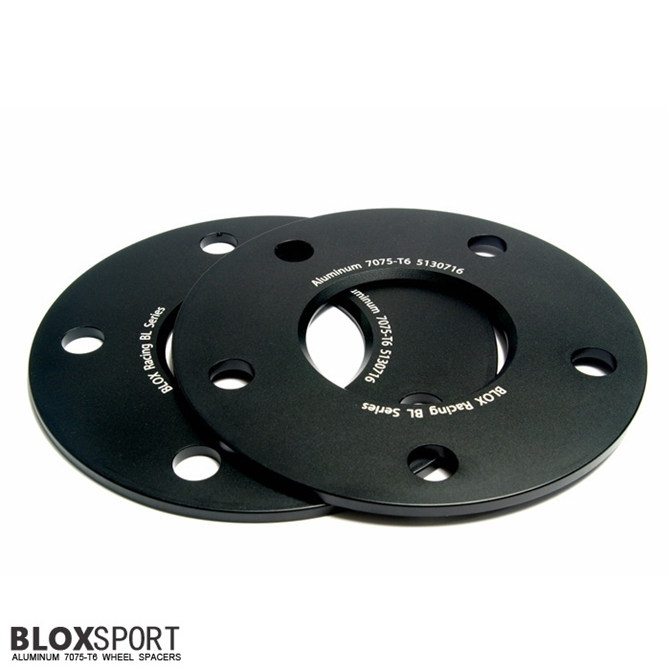 BLOXsport Forged Aluminum Alloy 6061-T6 Wheel Spacers (50mm) for Range Rover Sport (Example 4).